A radio navigation research team from the Cockrell School's Department of Aerospace Engineering and Engineering Mechanics successfully discovered they could subtly coerce a 213-foot superyacht off its course, using a custom-made GPS device. The purpose of the experiment was to measure the difficulty of carrying out a spoofing attack at sea and to determine how easily sensors in the ship's command room could identify the threat. The animation above shows how they did it. Led by assistant professor Todd Humphreys of the Department of Aerospace Engineering and Engineering Mechanics at the Cockrell School of Engineering, the team was able to successfully spoof an $80 million private yacht using the world’s first openly acknowledged GPS spoofing device. Spoofing is a technique that creates false civil GPS signals to gain control of a vessel’s GPS receivers. The purpose of the experiment was to measure the difficulty of carrying out a spoofing attack at sea and to determine how easily sensors in the ship’s command room could identify the threat. 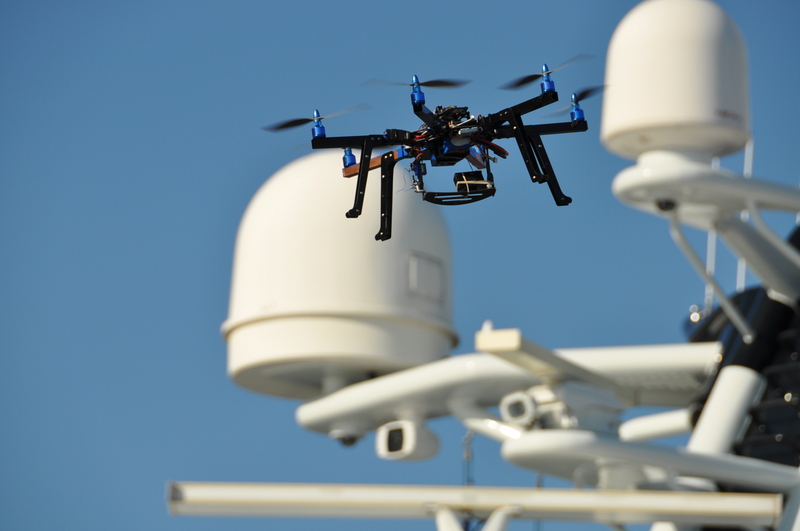 The researchers hope their demonstration will shed light on the perils of navigation attacks, serving as evidence that spoofing is a serious threat to marine vessels and other forms of transportation. In 2012, Todd Humphreys and his research team received national and internation attention for successfully demonstrated for the first time that the GPS signals of an unmanned aerial vehicle (UAV), or drone, can be commandeered by an outside source — a discovery that could factor heavily into the implementation of a new federal mandate to allow thousands of civilian drones into the U.S. airspace by 2015. The experiment was performed on a civilian drone owned by the university. Last year, Humphreys and a group of students led the first public capture of a GPS-guided unmanned aerial vehicle (UAV), or drone, using a GPS device created by Humphreys and his students. “With 90 percent of the world’s freight moving across the seas and a great deal of the world’s human transportation going across the skies, we have to gain a better understanding of the broader implications of GPS spoofing,” Humphreys said. 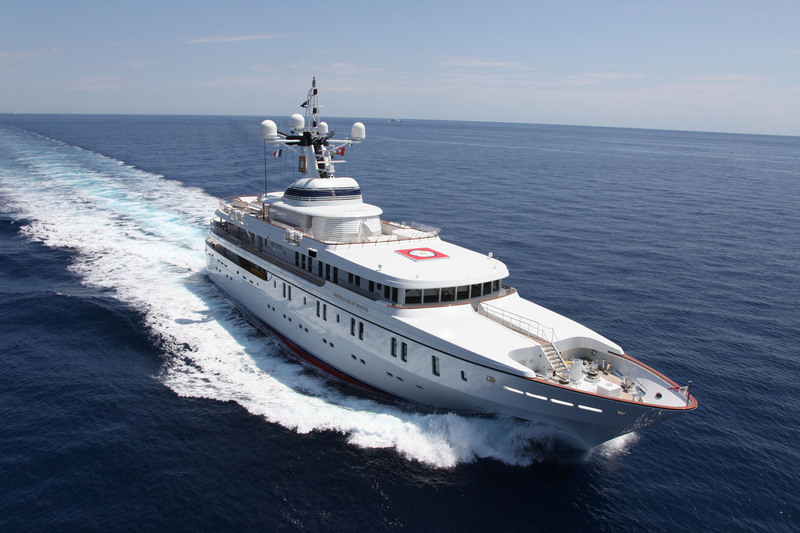 In June, the team was invited aboard the yacht, called the White Rose of Drachs, while it traveled from Monaco to Rhodes, Greece, on the Mediterranean Sea. The experiment took place about 30 miles off the coast of Italy as the yacht sailed in international waters. 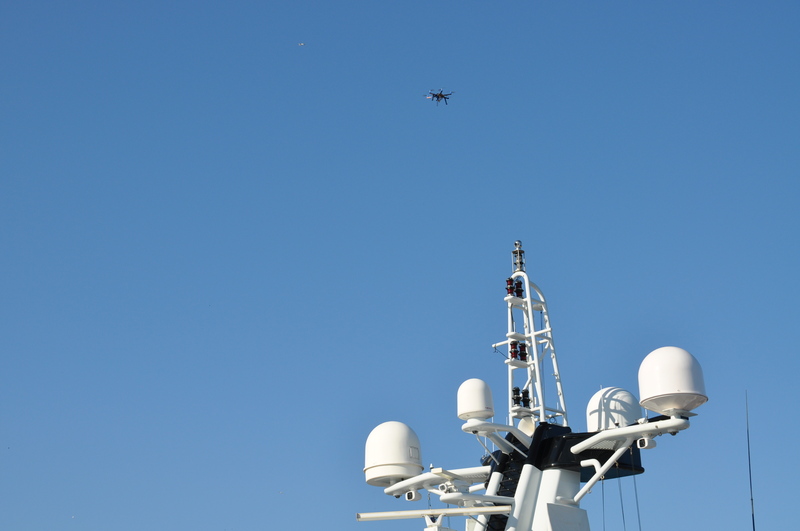 From the White Rose’s upper deck, graduate students Jahshan Bhatti and Ken Pesyna broadcasted a faint ensemble of civil GPS signals from their spoofing device — a blue box about the size of a briefcase — toward the ship’s two GPS antennas. The team’s counterfeit signals slowly overpowered the authentic GPS signals until they ultimately obtained control of the ship’s navigation system. Unlike GPS signal blocking or jamming, spoofing triggers no alarms on the ship’s navigation equipment. To the ship’s GPS devices, the team’s false signals were indistinguishable from authentic signals, allowing the spoofing attack to happen covertly. Once control of the ship’s navigation system was gained, the team’s strategy was to coerce the ship onto a new course using subtle maneuvers that positioned the yacht a few degrees off its original course. Once a location discrepancy was reported by the ship’s navigation system, the crew initiated a course correction. In reality, each course correction was setting the ship slightly off its course line. 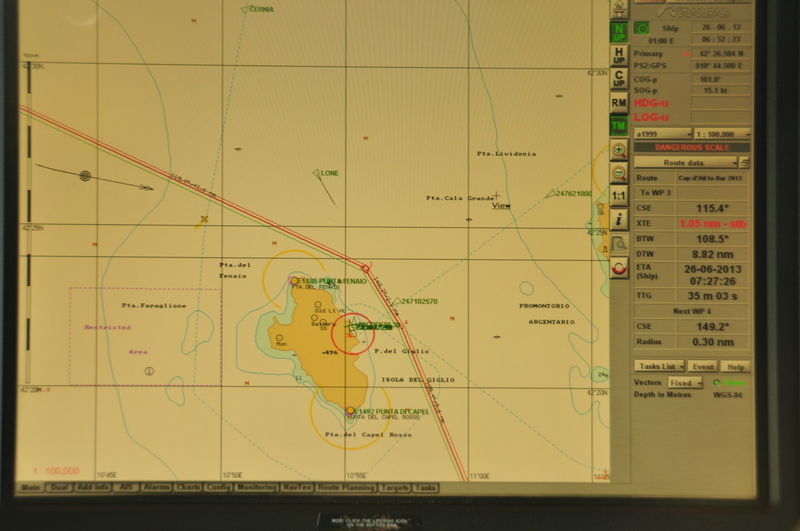 The Electronic Chart Display and Information System, or ECDIS, shows the ship's GPS-based location and the planned route over a navigational chart. The route is determined by a set of waypoints connected by straight lines. The route shown here passes by Giglio Island, where the cruise ship Costa Concordia ran aground. The ship's current location and direction of travel is indicated by the black target and arrow, respectively. Inside the yacht’s command room, an electronic chart showed its progress along a fixed line, but in its wake there was a pronounced curve showing that the ship had turned. After several such maneuvers, the yacht had been tricked onto a parallel track hundreds of meters from its intended one — the team had successfully spoofed the ship. The experiment helps illustrate the wide gap between the capabilities of spoofing devices and what the transportation industry’s technology can detect, Humphreys said. Chandra Bhat, director of the Center for Transportation Research at UT Austin, believes that the experiment highlights the vulnerability of the transportation sector to such attacks. “The surprising ease with which Todd and his team were able to control a (multimillion) dollar yacht is evidence that we must invest much more in securing our transportation systems against potential spoofing,” Bhat said. It’s important for the public and policymakers to understand that spoofing poses a threat that has far-reaching implications for transportation, Humphreys said. “This experiment is applicable to other semi-autonomous vehicles, such as aircraft, which are now operated, in part, by autopilot systems,” Humphreys said. As part of an ongoing research project, funding and travel expenses for this experiment were supported by UT Austin’s Wireless Networking and Communications Group through the WNCG’s Industrial Affiliates program.